Yesterday I texted my friend Eliza and asked her to go on a run. She offered me a 7:15am run time the next day (way too early) or offered a burger date. I went with the latter and she suggested we check out Bareburger since we both live relatively close. Eliza is wheat intolerant and when we arrived we were happy to see that Bareburger has a gluten free tapioca bread bun; I'm normally forced to order my burgers wrapped in lettuce so it was nice to have a different option. Bareburger serves up organic burgers but not only cow burgers; they also serve bison, turkey, ostrich, and veggie patties. I opted for the veggie patty after being assured it is gluten free while Eliza opted for the bison patty. We both went for the tapioca bun (a 35-cent surcharge) and decided to share a basket of fries. I'm really kicking myself for not bringing my phone to the meal because I couldn't take pictures of the amazing burgers when they came out. These burgers were difficult to eat they were so tall! Better yet, they were delicious. When they first arrived we were both dubious that they had been served on tapioca buns because the bread looked and felt so real. That's right, I picked at the bun before biting into it. I'm so used to poor bread imitations when I order gluten free bread at a restaurant that I was shocked by the quality of the buns at Bareburger. Lest I forget, the veggie patty was also delicious. 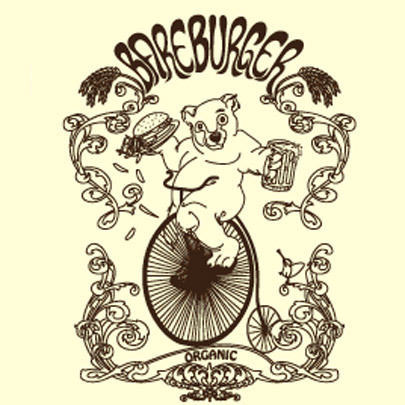 I'll definitely be visiting Bareburger again, not only because of the restaurant's amazing gluten free bun but also because of its delicious veggie patty and its commitment to organic meat. As I mentioned I ordered the veggie patty but the restaurant's commitment to organic meats, and in some cases grass-fed, hormone- and antibiotic-free meat, makes me feel good about patronizing this burger shop over other competitors. The restaurant also has various locations around New York City; for a full list, check the site here.